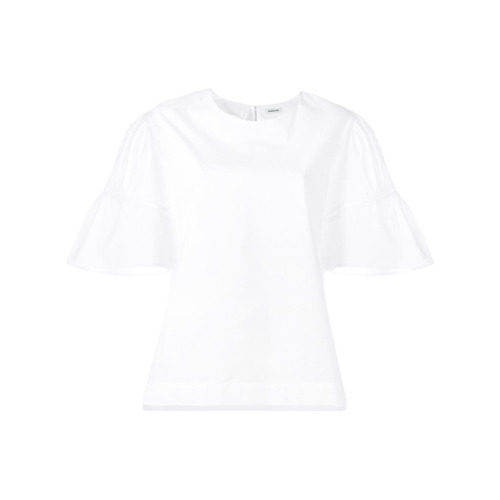 White Crew-neck T-shirt by P.A.R.O.S.H. If you're on a mission for a casual yet absolutely chic ensemble, consider teaming a P.A.R.O.S.H. 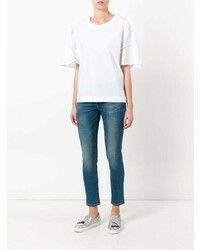 plain t shirt from farfetch.com with blue skinny jeans. Both garments are totally comfy and will look fabulous together. You could perhaps get a little creative in the shoe department and dress up your getup with dark brown suede ankle boots. Reach for a white crew-neck t-shirt and a black leather mini skirt for an easy to wear look. And if you want to instantly up the style ante of your look with one piece, enter black cutout leather ankle boots into the equation. This combination of a white crew-neck t-shirt and a dark green plaid pencil skirt is an interesting balance between casual and flirty. You could perhaps get a little creative in the shoe department and spruce up your look with black canvas heeled sandals. If you're after a casual yet totally chic outfit, consider wearing a P.A.R.O.S.H. plain t shirt and blue denim shorts. Both garments are totally comfy and will look fabulous paired together. For footwear, go down the classic route with beige leather ankle boots. If you're on a mission for a casual yet absolutely chic ensemble, marry a P.A.R.O.S.H. 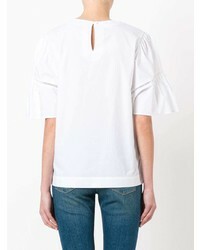 plain t shirt from farfetch.com with black skinny jeans. Both pieces are totally comfy and will look fabulous together. When it comes to footwear, this look is round off really well with tobacco leather chelsea boots. Dress in a white crew-neck t-shirt and navy ripped skinny jeans, if you feel like relaxed dressing without looking like a hobo. You could perhaps get a little creative in the footwear department and elevate your getup with red suede pumps. If you're in search of a casual yet totally stylish getup, pair a white crew-neck t-shirt with a black pencil skirt. Both garments are totally comfy and will look fabulous together. Dress up this getup with black leather pumps. Pair a P.A.R.O.S.H. 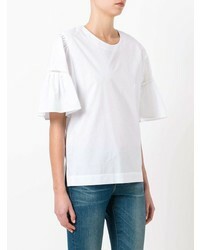 plain t shirt from farfetch.com with black leather leggings, if you feel like practicality dressing without looking like a hobo. Bring a touch of sophistication to your outfit with black leather ankle boots. If you're searching for a casual yet totally stylish ensemble, go for a P.A.R.O.S.H. plain t shirt and light blue jeans. Both pieces are totally comfy and will look fabulous together. Rocking a pair of black leather loafers is a simple way to add some flair to your ensemble.